Miss Olive’s VERY FIRST Book is Here! Woof Woof! Miss Olive Finds Her “Furever” Home is now available! 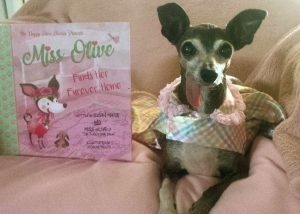 Miss Olive Finds Her “Furever” Home is the first book in the heartwarming and inspirational series The Doggy Diva Diaries. When we first meet Miss Olive, she is a sad and lonely little pup hoping to find a loving family and her “furever” home. With the help of her magical fairy dog-mother, “Sophia the Doggy Diva,” Miss Olive learns a valuable life lesson: It doesn’t matter what you look like on the outside. It’s the kindness and love you have on the inside that counts. Your dreams really can come true!